Tooth decay and advanced periodontal (gum) disease can cause a lot of pain and degrade the quality of a natural tooth so much that extraction is the only real option. Other reasons for removal include impaction, which occurs when teeth are unable to grow into the proper position because of other teeth, irreparably broken, bone structure, or other gum issues. This is the primary reason why wisdom and other teeth are removed. Left untreated, a broken, infected, or impacted tooth can cause escalating pain and serious health issues. If your teeth are infected or otherwise compromised to the point that they should come out, our dentists at Cobbins Brook Smile Clinic will relieve your pain and get you back on the road to good dental health. 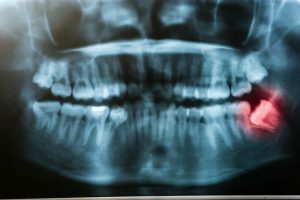 Before commencing treatment we will X-ray the tooth or teeth to review the extent of the issue and determine how to best proceed. Then, after using local anaesthesia to numb the area, we remove the tooth. If it is broken or not yet erupted, a more intricate surgical extraction will be necessary, but we will ensure that you are comfortable and pain-free the entire time. You may experience some swelling and tenderness afterwards, but cold compresses and over-the-counter pain medication will manage these symptoms until they subside. Early removal of wisdom teeth is strongly recommended to avoid such problems and minimise surgical risk. Prior to your surgery, your sedation options will be reviewed, to help you decide on a method that’s best for your circumstances. After the teeth are removed, your gum is sutured and you will rest in our office under supervision until you are ready to be taken home. We will provide you with a postoperative kit that includes aftercare instructions, a prescription for pain medication, and antibiotics. We will also schedule you for a follow-up appointment to see how you are progressive and remove sutures. Extra care when brushing near the extraction site. If you have any questions or concerns after your wisdom tooth extraction, please call us. Your health and well-being are extremely important to us.